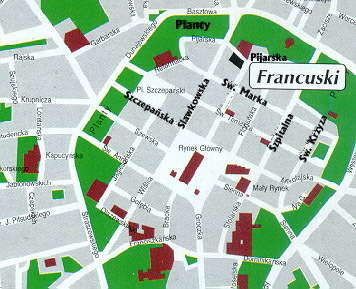 Francuski hotel is located in the historic center of Krakow, in a quiet surrounding next to the old walls of the city, and Plants. The hotel offers 4 single rooms, 23 double rooms and 15 apartments. All rooms have satellite TV, radio, direct dial telephone, free Internet access, tea/coffee making facility and a mini-bar. The restaurant offers traditional Polish menu as well as international dishes, with a touch of French cuisine. There is also a nice meeting room "Olimpijska" for up to 30 persons, equipped with audio visual devices. Guests will also enjoy a computer terminal with Internet access. For recreation there is a fitness center. In the hotel guests will admire a gallery of paintings and sculpture. There is also a jewellery shop. Pets are allowed. 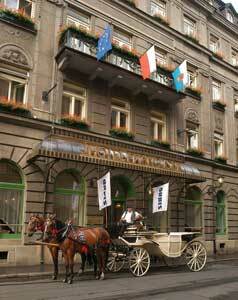 The hotel also organizes excursions to Krakow and surroundings, transfer, booking tickets for cultural events. The hotel is located in the historic center of Krakow - opposite the Czartoryski museum and near the Old city Walls; 1km from the train station and 15km from the airport.